Lim Chu Kang is a public road located in the northwestern part of Singapore. A stretch of Lim Chu Kang, a six-carriage way public road doubles up as an alternative runway for military aircraft. 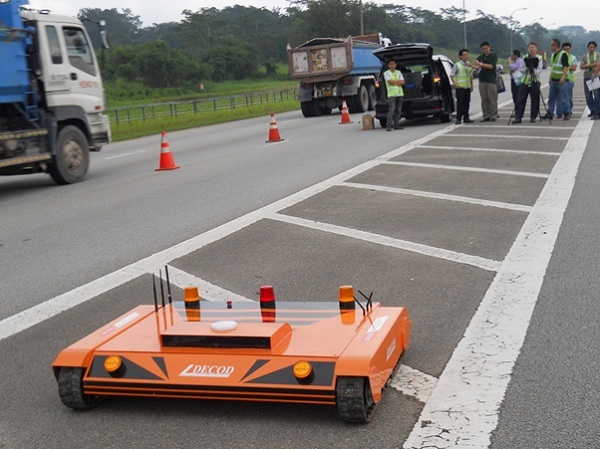 On the morning of 7th Aug 2013, DECOD’s tracked vehicle, X’plox which houses a real time, 3D UWB antenna array system was deployed to undertake sub-surface scanning to establish the structural composition and layout that resides below the road surface. DECOD X’plox embarked on its scanning mission at the trigger of a start button on the remote control, moving steadfastly towards the shadow vehicle. This is the designated location where planes take-off, land, excute manoeuvres such as ‘touch and go’ during the Alternate Runway Exercises held by RSAF (Republic of Singapore Airforce) on a periodic basis. The remotely–controlled DECOD X’plox treading on the road surface and simultaneously, capturing and transmitting real time 3D data to the control panel mounted on the tripod stand.